The best thing about living on an island such as ours is that we are surrounded by water. 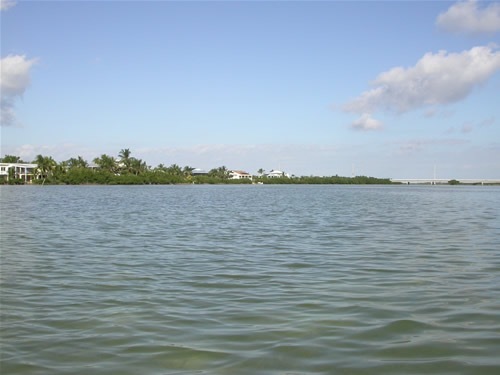 Breezeswept residents are fortunate to have exceptional water access from our canals and shorelines for ocean or gulf fishing, cruising and sailing, or kayaking in the near shore shallow waters. The deep water channel on the south end of our main canal is well-marked and easy to navigate. We are also fortunate to have clean, clear water, flushed continually by the strong incoming and outgoing tides. The Torch-Ramrod Bridge allows water to flow freely from gulf to ocean and ocean to gulf through Newfound Harbor. Our canals are among the cleanest and clearest in all the Keys, due to the efforts of our citizens to keep them free of debris and pollutants, and to the culvert that connects our canal system on the north end of the island to the open water. BBECA’s Water Quality Committee monitors canal and near shore waters through periodic sampling. Please read The Future of Our Canals for more information. On our island, palm trees are typically the main features of landscaping. Colorful blooms from flowering trees, shrubs and plants enhance the scenery. The pedestrian paths that line both sides of West Indies drive make it safe to walk or bike through the neighborhood. At night, the sky glows with subdued light from the moon and stars, not from glaring street lamps or flood lights. We can wash our cars or engage in more enjoyable outdoor activities almost any day of the year, and when it is cloudy or rainy, we can celebrate the change and enjoy a refreshing beverage at one of our nearby watering holes. On occasion, a hurricane will threaten our idyllic existence. This gives us all plenty to talk about during the days before and after a storm does or doesn’t hit. But hurricanes are typically few, far between, and less of a problem than the blizzards, tornadoes, tremors, Nor’easters and such that threaten other parts of the world. We stock up on emergency supplies, fire up the generator and ride out the storms, or take a hiatus to the Mainland. Ramrod and our neighboring keys did suffer varying degrees of damage and discomfort from Hurricane George in 1998 and Hurricanes Dennis, Rita, Katrina, and Wilma in 2005. You can read more about these storms in the Hurricanes section. All in all, Breezeswept Beach Estates is a quiet, peaceful, and friendly neighborhood. While our association is primarily social in nature, we do offer suggestions about how residents can be good neighbors, and we have committees and volunteers to further common objectives. This section of the BBECA web site contains useful information that we hope will be helpful to new and current members alike.